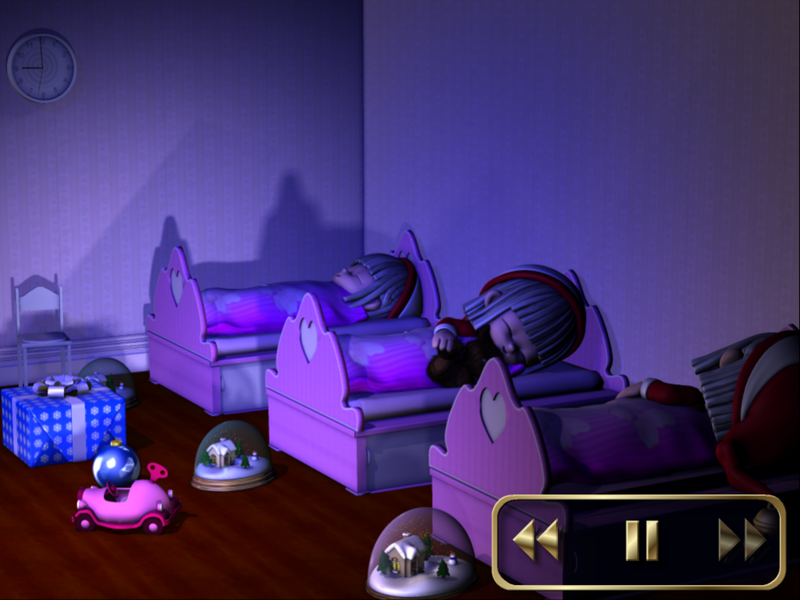 This is a Family Friendly 3D animated Christmas time story about triplets and best friends Nanna, Nelly and Nina. Join them in their adventure! Have they been good girls this year? Will Santa Clause show up tonight? Well find out by downloading this adorable Christmas time story. It was released Christmas 2010. It was a quite simple version with 3D stills only. It got a lot of useful feedback from end users on very many aspects of the app. This then helped to improve and make it better. I am are very thankful for these comments. Why did you decide to develop A Christmas Tale app? This book project started up as an experiment just for fun. I wanted to make a fun Christmas book for my 3 children aged 3-7 years. I wanted to engage them and let them recognize common Christmas happenings. The first time it took about four weeks and every year we spend about four weeks improving it. My favourite page in the app is the last sleep scene. My favourite feature is the new back and forward buttons. They are very responsive and allows fast scrolling of the pages. Yes next Christmas we will have another update. Any user feedback will be taken into account when adding new features in next version. Age range would be 1-7 years. What was the biggest challenge when developing this app? The biggest challenged was to model, animate and render the 3D Scenes – this was very time consuming. Why are you using 3D in the development of the app? I have always been into 3D and it was obvious to me that I wanted to use 3D technology when developing this book app. As the first version only had 3D stills as pages, the second version had 3D animated pages, the natural progression would be to develop and extend the book in new directions. The 3D scenes modeled for this project also gives a great potential and freedom for further development of the story and even add more functionality and layers of interaction. What have you learned from this app project? When working on a book project like this, you constantly evaluate try out the different options you have, to achieve the picture and the goal you have in your mind. I have learned so much from this process and will take this experience with me when starting new projects. Are you currently working on any new app projects? Yes I am currently working on both a game and book apps. What is your ideal goal when creating a Book App? My ideal goal is to make a book advanced in terms of a rich media experience combined with a certain level of user interaction. At the same time the book should be very simple to use for all kids and absolutely no room for confusion. It should be honest and to the point.